How big of a font should you use on your PowerPoint slides? One of the questions that comes up often in my workshops is "How big of a font should I use?" The answer is ... It depends. You certainly don't want to do what I have seen twice that set the record for smallest font used on a slide in my experience. These presenters used a four point font. No, that is not a typo. Four (4) point! And they expected the audience to be able to read it. So how do I answer the font size question? I did the research to come up with a way that I could determine an appropriate font size. I started by considering visual acuity. This is the term used for how well we see. It is what the optometrist measures using the eye chart that starts with the large "E" at the top and smaller lines below. They determine your visual acuity based on how tall a letter you can clearly see at what distance. It is important that we have the letters on our slides large enough so most people can see them. But the next challenge was to figure out what level of visual acuity I should assume for most audiences. To answer the average vision question I turned to the standard they use for road signs in North America. There is a manual for designers of road signs that specify how big the letters should be in order for the text to be read at a certain distance from the sign. So I used these standards and the visual acuity measurement standards to determine that road signs assume approximately 20/35 vision (20/20 is perfect vision). So, to be conservative, I assume 20/40 vision (it is also one of the standard measurements). I then used a projector to calculate the ratio of height of a standard Arial font to the width of the projected image. This allows me to know how tall a letter of a particular point size will be on a screen of a certain size and aspect ratio. Now I had all the parts I needed. Using the assumptions of 20/40 vision and that the image fills the screen, I could calculate the maximum distance that an audience member should be to comfortably read a font of a certain size. Now I can answer the font size question based on research, not on a feeling. There is no one single answer, it depends on screen size and the distance of the furthest person in the room. All of this work has been put into easy-to-use tables in Adobe PDF format that you can download below. You are free to tell others about these tables. If you want to use it in your teaching or consulting work, please make sure that you do not alter the page and that you give credit to the source. Now you have a way to answer the question of "How big of a font should I use?" More meeting rooms are replacing projectors with flat screen TVs. While a large TV looks huge in your living room, the image it shows is not nearly as large as a projector when viewed in a meeting room. The other challenge is that these screens are widescreen, meaning the letters are smaller for a similar screen width. Here is the table for widescreen TVs. What should you be thinking of after you select the correct font size for your slides? What font face should you use? Read this article on why I suggest you select a boring font. Is the message of your presentation clear? Use the GPS approach to create a clear message for your presentation. 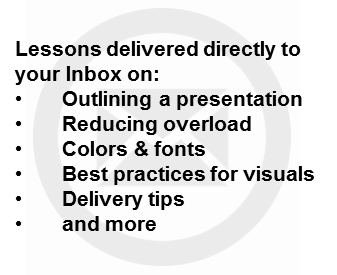 How can you select visuals instead of slides full of text or spreadsheets? Use the approach in my book Select Effective Visuals: The Business Professional's Guide to Selecting & Creating Effective Presentation Visuals. When you have selected the correct font for your presentation, you want the text to look crisp and clear when projected to the audience. The best connection is achieved when using a digital connection to the projector or screen if it is available. How you connect will depend on what ports your laptop has. Here are the most common options and the equipment I recommend using in each case. If your laptop has a regular HDMI port, you can plug an HDMI cable in and you are ready to go. If the projector does not have an HDMI cable, but has a VGA cable instead, use this HDMI to VGA adapter. I have used it with a very long high-quality VGA cable and it worked perfectly. If the HDMI cable to the projector is not long enough to reach your laptop, you can use an HDMI extension cord and F-to-F HDMI adapter to connect the extension cord to the projector cable. To connect your laptop to a projector cable you will need an adapter. I recommend one that gives you multiple output options, like this one that offers an HDMI, VGA, and DVI outputs. This is the one I use at my desk and when travelling. If you need to extend the projector connection, use the HDMI cable and adapter listed above. Newer laptops are moving to just offering a multi-function USB-C port instead of a port that is just for video output. If your laptop has this type of port, you will need an adapter that offers video outputs and a charging port if your laptop only offers charging through the USB-C port. The USB-C adapter/hub market is still developing and the one that looks best to me is this one from Anker, a company I have found reliable for adapters. Since this adapter (& most USB-C adapters) only offer an HDMI port, if you need to connect to a VGA projector cable or the HDMI cable is not long enough, use the links above to connect your laptop to the projector or screen. Want to learn in detail how you and your colleagues can create presentations that have a clear message, focused content, and effective visuals? Check out my customized workshops.